Duluth East's JoJo Jeanetta stonewalls Moorhead's Logan Ness (Photo by Tim Kolehmainen). Duluth East's Trevor Olson (Photo by Tim Kolehmainen). Sophomore Conner Valesano and junior Trevor Olson each scored two goals and an assist as Duluth East shut down Moorhead, 6-0 at the Moorhead Sports Center Wednesday afternoon. The game was originally scheduled for Tuesday night, but was postponed less than 24 hours due to weather-related school cancellations in Duluth. The short lay-off didn't appear to bother the Greyhounds (6-1-0), as they displayed crisp passing and puck movement all game long. The line of sophomores Valesano and Ryan Lundgren and senior Phil Johnson was particularly effective, controlling play for long stretches of time. Valesano opened the scoring midway through the first period with an assist to Lundgren. The pair moved up from Bantam A this past off-season and have been a boost to the Greyhounds. They teamed up for three of the first East goals (two from Valesano, one from Lundgren) as the lead ballooned to 5-0 after two periods. “Whenever you score goals on the road and get off to a good start and pop a few in, your confidence grows,” said Randolph. “When you have a breakdown in hockey, if you let up for a couple of seconds, that’s what happens,” countered Moorhead coach Dave Morinville. Olson capped the scoring just 32 seconds into the third period with his second goal of the night, sending the game to running time. Junior Jake Randolph chipped in with three assists and Nate Kotter and Nate Repensky each had two assists. JoJo Jeanetta stopped all 23 Moorhead shots for the shutout, including several acrobatic saves in the first period when the game was still in doubt and a handful in the third to preserve the shutout. The senior goaltender has now gone more than two full games since last allowing a goal, shutting out Cloquet/Esko/Carlton in his last start on Dec. 16. 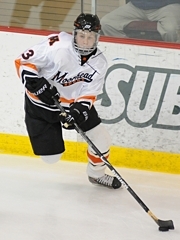 Michael Bitzer faced 36 shots for Moorhead (2-2-1), saving 30. After graduating much of their scoring from last year, the Spuds have struggled to find their offensive game so far this winter, scoring just eight goals in five games. Both teams are off until the holiday tournaments next week. Moorhead faces Bloomington Jefferson in the St. Louis Park tournament on Tuesday, Dec. 28, while Duluth East opens the Schwan Cup Gold Division play against Edina on Wednesday, Dec. 29. Duluth East's Conner Valesano (Photo by Tim Kolehmainen). Duluth East’s dynamic sophomore duo of Conner Valesano and Ryan Lundgren certainly enjoyed a coming out party Wednesday afternoon in Moorhead. The talented pair combined for three goals and three assists as the Greyhounds shut down the Spuds, 6-0. Their effort brought a smile from Duluth East coach Mike Randolph in the postgame interview, as he felt they deserved a boost from their hard work. Both were high-scoring playmakers for the East Bantam A team last winter and have been adjusting to the pace of varsity hockey this season. “The nice thing is on this team is that they don’t have to carry the load,” said Randolph. “This year, they’re part of a team. You’re seeing them feel their way onto the team, feel their way with this group of kids and realizing they don’t have to be ‘the guy’ this year. And they’re starting to produce, as well. Randolph recently switched up his lines in an effort to get more scoring from multiple lines. At season’s start, he’d divided Valesano and Lundgren, but decided to join them back up in recent games. Valesano admitted that the speed of the game was the toughest adjustment from Bantam hockey. After a slow start, though, the pair has been coming on of late. Against the Spuds, Valesano netted a pair of goals and an assist, while Lundgren had a goal and two assists – each getting the helper on the other’s goals. That’s the kind of teamwork each expects from the other. “I know where he is on the ice without even looking,” said Valesano. Through seven games, Valesano is fifth on the ‘Hounds in scoring with four goals and five assists, while Lundgren is right behind with two goals and four assists. They’re not the only youngsters contributing, however, as Toscano (1-1-2), sophomore defensemen Andrew Kerr (1-2-3) and Meirs Moore (1-6-7) and freshman defenseman Phil Beaulieu (2-1-3) are also chipping in with regular minutes. 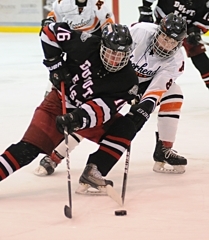 Moorhead's Terry Leabo (6) gets up high on a check to Duluth East's Jake Randolph (Photo by Tim Kolehmainen). Order game photos from the Breakdown! Jeanetta, a senior goaltender for the Greyhounds, stopped all 23 shots he faced to earn the shutout victory. While his defense was strong much of the night, there were a handful of breakdowns where Jeanetta's acrobatic saves were needed. Valesano, a sophomore forward, netted two goals and an assist while teaming with linemates Phil Johnson and Ryan Lundren to wreak havoc in the offensive zone. The line exhibited great puck control and pin-point passing. 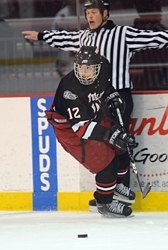 Olson, a junior forward, continued his scoring ways with two more goals and an assist. He leads the Greyhounds in scoring through seven games with 20 points.